Fresh grilled shrimp can be the star attraction of any party, get together, social event or for game time. It can also be a complete dinner or served over a fresh salad for lunch the next day. Really, the possibilities are endless. This recipe uses several basic ingredients, many of which you probably already have in the house. The cayenne pepper gives the shrimp the spicy flavor you come to expect from a cajun dish, and the white pepper really accentuates all the flavors. If you’ve not used white pepper before, go get some, you’ll be glad you did! Mix all ingredients together, except shrimp, in a shallow dish. Use a whisk on it for about a minute to make sure it’s all good and distributed well. Add shrimp and coat well. Cover and let marinade in fridge for at least 15 minutes. If you can let it sit for a couple of hours, even better. Preheat your George Foreman Grill with the lid closed for at least 5 minutes. Use the high setting if you have it. 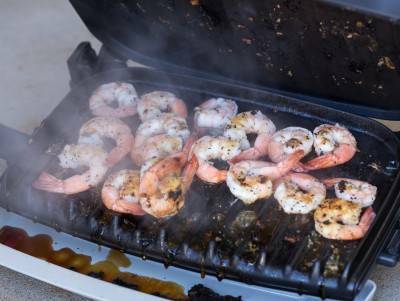 Place shrimp on the grill and close lid. Grill shrimp for about 3-5 minutes. They’ll be firm to the touch and an opaque color when done. I have been grilling Cajun Shrimp with a similar recipe for a few years. The Foreman Grill is amazing ! Usually my side dish is Jalapeno Grits and Cheese……I sometimes just place the shrimp on top of the grits….Makes me feel like I’m in the South. I have a George Forman Grill with variable temperatue setting in 25 degree increments. What temperature is best for schrimp, flounder or other seafood.